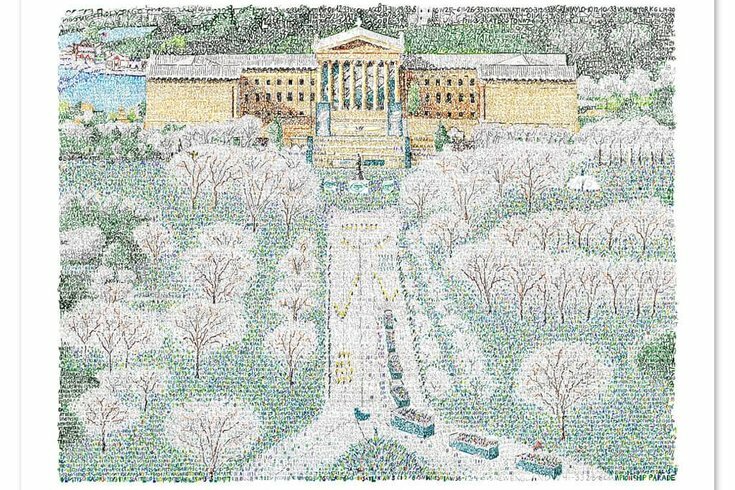 For more than 10 years, Dan Duffy has been making art work out of words, much of it in the shape of iconic Philadelphia landmarks, as well as sports competitors and venues. When the Eagles won the Super Bowl, he knew he had to make a new work to commemorate the occasion – it was just a matter of which one. “I always wondered, if we won the Super Bowl, what the image [was] gonna be,” Duffy, said in an interview with PhillyVoice Wednesday night. He considered various famous moments from the game itself, such as the “Philly Special” play, each of the touchdowns, Brandon Graham’s strip-sack of Tom Brady, or even just a picture of Nick Foles and Doug Pederson together. He even polled his Facebook friends about it. The result was Duffy’s latest work, an image of the mass of Eagles fans celebrating the long-awaited victory in front of the Philadelphia Museum of Art. You could say the Eagles’ first Super Bowl championship was the culmination of every game the franchise has ever played, and Duffy took that idea to heart: The words that form the picture are the date, opponent, W or L, and final score of all 1,188 games in Eagles history, from 1933 through the Super Bowl. Duffy said he based the work on a fixed camera feed from a local news station the day of the parade, which he attended and recorded at home. After a few days of recovery from the Super Bowl and parade, Duffy got working on the project, which he says took between 150 and 200 hours. “I wanted to get the biggest sea of people at the parade,” he said, which was part of why he used that angle and not, say, an action shot of the Jason Kelce speech. Duffy previously created an Eagles logo featuring the names of every player in the team’s history – with Carson Wentz listed last alphabetically – as well as a Brian Dawkins tableau consisting of the Eagles legend’s pre-game speeches. He’s also done the LOVE sculpture, the Philadelphia skyline, Bruce Springsteen and Brad Lidge’s celebration of the 2008 Phillies championship. The 37-year-old Lansdale native said he always appreciated art growing up, and learned to appreciate the style of pointillism that informs his current work from an unlikely source: The art museum gallery scene in "Ferris Bueller's Day Off." He attended the Hussian School of Art and noted the irony that while artsy kids are often outcasts in high school, he felt the same as the sports-loving kid at art school. Duffy got serious about his craft around the time he met his now-wife. “I had to step my game up,” he said, and for a time sold his work in the K Lot, outside Phillies games, while working a day job as a graphic designer. He eventually quit that to do his art full time, and got some entrepreneurial help from the Goldman Sachs 10,000 Small Businesses Seminar – to the point where he says, he now puts aside sports talk radio in favor of e-commerce podcasts. He now has two full-time employees working for him. The parade art, along with Duffy’s other work, is available as a 16x20 print for $49.99, with a double matte and frame going for $199.99, on PhillyWordArt.com. You can find his locally-focused work there and his overall work at ArtofWords.com.